The Skirvin Hilton has long been a favorite OKC event center, meeting, and event venue for businesses and organizations across the country. The Skirvin Hilton boasts 225 luxuriously appointed guest rooms and suites, 18,500 square feet of meeting space, two ballrooms, three world-class board room rentals, three sumptuous event rooms, and a pre-function lounge room. As one of the city's leading hotels with conference rooms, we offer quite a selection for your meeting events in OKC! 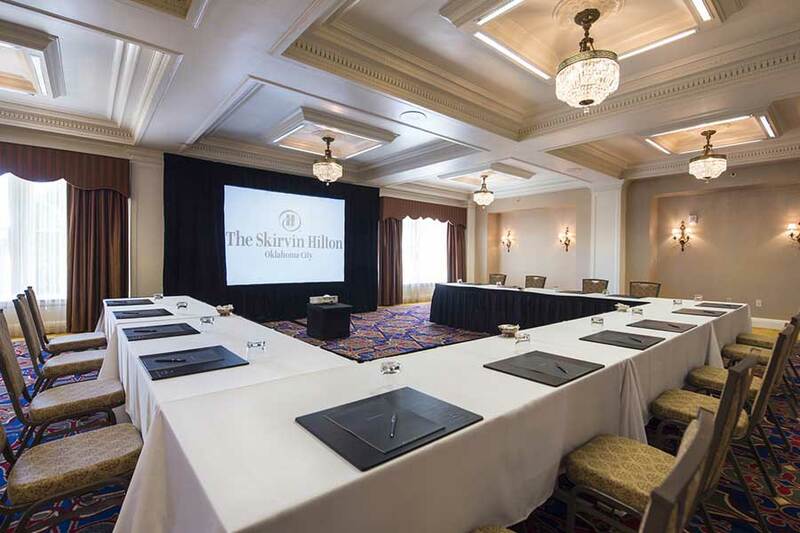 The Skirvin Hilton is conveniently located near downtown Oklahoma City’s most popular attractions, which makes it one of the top hotel conference room rentals and board room meeting locations. This includes Chesapeake Energy Arena, Bricktown, Oklahoma City National Memorial, Civic Center Music Hall, Cox Convention Center, Oklahoma City Museum of Art, and Myriad Botanical Gardens. Book our hotel meeting room rentals today and experience the finest conference rooms Oklahoma City has to offer!